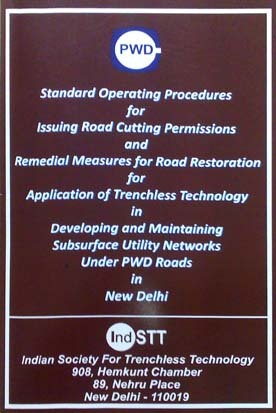 IndSTT has developed the Standard Operating Procedure for Issuing Road Cutting Permissions and Remedial Measures for Road Restoration and Standard Operating Procedure Manual for Application of Trenchless Technology in Developing and Maintaining Subsurface Utility Networks under PWD Roads in Delhi for Public Works Department (PWD) Delhi Government. 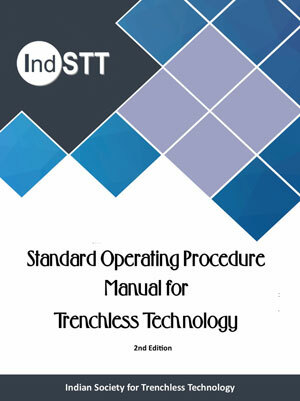 In addition to Standard Operating Procedures these documents also deal the remedial measures for road restoration required during application of Trenchless Technology in developing and maintaining subsurface utility networks under PWD Roads in New Delhi. In addition to the procedures, these documents also provide the activity flow charts and submittal details required to be submitted at different stages of works. 1. To provide appropriate guidance for execution of subsurface utility development & management works through trenchless technology. 2. To provide appropriate guidance for restoring the road surfaces after completion of works executed through trenchless technology. 3. To provide appropriate guidance for restoring the road surfaces in case of settlements/cave-ins either during execution or at a later date.